With a domestic box office gross of just $15 million, Andrew Dominic’s crime film Killing Them Softly didn’t strike much of a chord with moviegoers in November, 2012. Now on home video, this gritty look at the aftermath of a mob-controlled poker game robbery has a chance to reach more people. It’s exactly the kind of a movie that’s more suited for the intimacy of home viewing on a smaller screen. These days it seems like the multiplexes are dominated by theme park rides instead of movies. Hey, with current ticket and concession prices, I don’t blame patrons for wanting something livelier than Killing Them Softly. Were it not for the presence of star and co-producer Brad Pitt, this one might have bypassed the big screen altogether. Add to that the fact that Pitt doesn’t appear on screen, as hitman Jackie Cogan, until well the film’s second act. 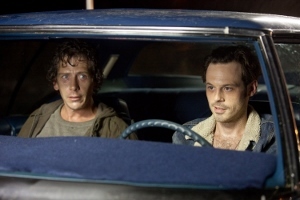 The first is dominated by the brainless exploits of Frankie (Scoot McNairy) and Russell (Ben Mendelsohn), hired by Johnny “Squirrel” Amato (Vincent Curatola) to waltz into a backroom card game and with a sawed-off shotgun and walk out with everyone’s money. 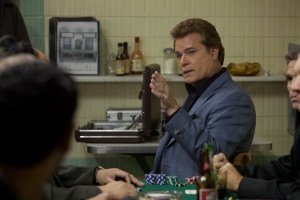 It’s Markie’s (Ray Liotta) game. He even warns the two dummies that the Mafia bosses will never let them survive this, going so far as to offer Russell the chance to walk out unscathed. Markie knows the pitfalls all too well, having successfully knocked over his own game in past with the assistance of two patsies similar to Russell and Frankie. In fact, Squirrel is banking on the bosses assuming it was Markie trying to pull the same stunt twice. The gambit works initially, but Driver (Richard Jenkins) and Jackie begin to put the pieces together. In a way Killing Them Softly takes the form of a police procedural, only with the bad guys being policed by even worse guys. One such baddie is Mickey (James Gandolfini), a terminally depressed hitman brought in to help Jackie eliminate the robbery perps. If only he can stay away from hookers and put down the bottle long enough to do his job. Gandolfini delivers the standout performance, fully inhabiting what little is left of this broken man’s soul. Dominic wisely avoids Tarantino-style verbal exchanges, instead presenting the story as dryly as possible. He lapses into a few regrettably indulgent violent sequences. Sure, the death scene of one major character may look pretty cool, with multiple slow-motion car crashes and lots of bloody detail. But it doesn’t jive with the plain-spoken style he tells the rest of the story with. Such moments self-consciously draw attention to themselves without adding anything to the story. Too frequent allusions to the 2008 presidential campaign and concurrent economic crisis are a more serious hindrance. I appreciate the concept of the corporate financial collapse trickling down to effect even the bottom-feeders of the country. But the regular barrage of clips of Obama and Bush speeches is a little overheated. See it for the performances alone, if nothing else. Pitt is cooly efficient as part of the ensemble, rather than the outright star (something that may prove disappointing for his most ardent fans). With his strikingly Adam Sandler-esque voice, McNairy makes Frankie a bundle of immature insecurities. The perpetually sweating, nodding off junkie Russell is vividly captured by Mendelsohn. Don’t expect visual fireworks or even much forward momentum in the plot. 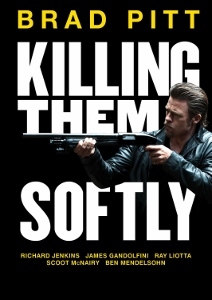 Killing Them Softly isn’t an action film or a thriller. It’s a pitch black comedy about the foibles of a bunch of dumb criminals who, as Richard Jenkins puts it in the DVD’s making-of featurette, honestly believe they’re smart businessmen.